Andrews McMeel Publishing, 9780740791963, 120pp. 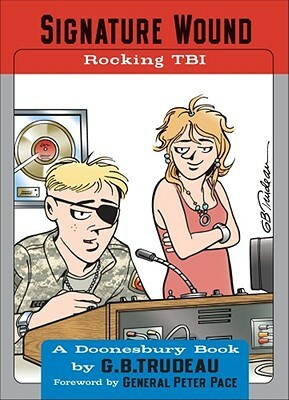 Signature Wound: Rocking TBI is Pulitzer Prize-winner Garry Trudeau’s third collection of Doonesbury comics examining the effects of combat on soldiers in Iraq. Signature Wound: Rocking TBI completes a trilogy of Doonesbury books that examines the impact of combat on American soldiers in Iraq. A twist of fate brings B. D. to the bedside of SFC Leo Deluca (a.k.a. Toggle), a young HUMV driver and headbanger whose love of ear-bleed battle music had sonically distracted him enough to get his vehicle blown up. Missing an eye and suffering from aphasia, Toggle fights to recover from traumatic brain injury (TBI), a journey of recovery that brings out the best in B. D., his former commander. Toggle's tattooed, metalhead mom initially has reservations about his improbable Facebook romance with an MIT tech-head named Alex, but love blooms. As this engaging story unfolds, Toggle finds himself drawn toward a career in the recording industry, undaunted by the limitations of the New Normal that now defines his life. Crafted with the same kind of insight, humor, and respect that prompted the Pentagon and the VA to host signings of the two previous books in the trilogy, Signature Wound is a perceptive and timely look at the contemporary soldier's experience.